This is a guest post by Anya Whiteside. Anya works for the Forum for Education NGO’s in Uganda and is also my fiance. ‘I was a business woman in Bor and then when the trouble started I just had to pick up my children and run’. I am standing in Ajumani in West Nile region, in the North West of Uganda which borders both the DRC and South Sudan. The woman I am speaking to is heavily pregnant and her three young children cluster round her. One of her daughters is about four and spends the next half hour sidling up to me to stroke my white skin all cheeky grin and dirty t-shirt. ‘My husband was in Kenya getting treatment for an illness when the fighting started’ she continues. Now she is sleeping on the floor of a school in Uganda hoping that he will come and find her. I am in West Nile as part of an inter-agency assessment of the schools in the areas of Uganda where South Sudanese refugees have flooded in the recent weeks. My colleagues are from various NGOs, the UN and the Ugandan Ministry of Education and Sports. Well over two thousand people cross the border every day into this remote, hot and dusty part of Uganda. Add to that recent new arrivals from the DRC, as well as many generations of refugees who fled here in the past and you have a patchwork of stories. The schools are due to open in the first week in February and are likely to receive large numbers of refugee children enrolling to join the classes. Our role is to assess what additional support they are likely to need. ‘I have one thousand children in my school’ one head teacher tells me, ‘but I expect an additional four hundred refugees to enrol this term’. Even before the recent crisis the schools in this area are full beyond capacity. It is not unusual to see a teacher teaching 90 children with four or five children squeezed onto each desk. Over and over again as we interview head teachers in the area they tell us they will enrol the extra children and they are happy to welcome them into the school, but that they need support to be able to cope. They need additional teachers to help teach and translate what they are teaching, textbooks, latrines, desks and classrooms. All resources they look unlikely to get, certainly in the numbers they need them. I am amazed by the way the schools in West Nile are so welcoming to the new influx and wonder how primary schools back home would react if in a matter of weeks you asked them to enrol 50% extra pupils many who speak a different language. One of the reasons may be that the area is so used to hosting refugees. For many years refugees have fled across the border from DRC or Sudan seeking safety from fighting. Some go back and some stay. Some of the new refugees have fled back to areas where they were refugees before, or gone to stay with family still in Uganda. Outside the reception centre it can be hard to tell who is a refugee and who is not, as people start to build mud huts in land allocated to them by the Ugandan government. One man who has been in Uganda for many years and is elected in the refugee settlement as a local leader tells me how his father was a politician under Mobuto’s regime in DRC. ‘When Mobuto was overthrown they chased him and cut him up into pieces’ he tells me, ‘and then they came for me’. He tells me how he drove away in a car full of people, but it was stopped before they could leave the country. All the women in the car were raped and then everyone was shot. After being shot he was thrown in the river. He was injured, but not killed, so was dragged out further downstream and rescued. He then escaped to Uganda he explains to me matter-of-factly while we are walking to visit a local school. Some Ugandans understand more than most the trauma of being uprooted from your home. ‘I hate seeing people here’ says my colleague as we drive into a refugee reception centre where newly arrived refugees clutch bags and look for shade. I have known my colleague for a while as a vivacious, hilariously funny and very competent member of the NGO community who went to University in Europe and now works as an education specialist. ‘Seeing it just reminds me of running away and all that time spent as a refugee in the jungle’, she explains. My colleague is from West Nile, the area where Idi Amin came from, and after he was overthrown the area was targeted for reprisal killings. Her house was set on fire and her and her family fled into the jungle in DRC. I wonder as she talks how many other people I know have terrible stories which I know nothing about. I also wonder how a country can heal from these stories when they are buried so deep and rarely talked about. Experiences of displacement in Northern Uganda are also more recent still. 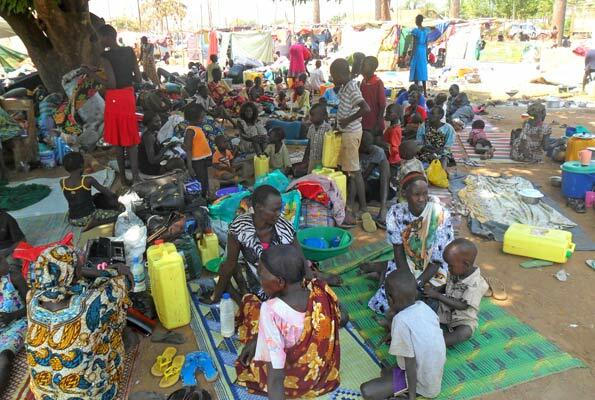 In 2005 the war between the Ugandan government and the Lord’s Resistance Army (LRA) saw 1.8 million internally displaced people in camps across Northern Uganda. After a week of talking to head teachers and local District official, hours and hours of bumping along dusty dirt road, visiting some of the refugee reception centres and hearing some of the refugees’ stories I am left with twin emotions. On the one hand I am sickened by conflict and the horrendous things it does to people. And on the other hand I am amazed by the human resilience and ability to cope. I return to Kampala thinking of all the refugees in the world and just how horrific it must be to flee your home. I am welcomed by the sickening news that of the 2.5 million Syrian refugees, my own country, the UK, has agreed to host a mere 500 Syrian refugees over a year. I am aghast and wonder how a country like the UK can choose to refuse safety to so many, when countries with so little resources such as Uganda receive thousands of refugees a day, or a tiny country like Lebanon can hosts over a million. As I rant and rave at the selfishness of my own nation I think back to the drive out of a refugee reception centres on our way back to Kampala. As I looked out the window I saw a group of scruffy children playing football. In the last month their whole lives have been uprooted and many have lost everything. They shout and skid through the dust imitating the moves of famous footballers. I wonder what will become of these children and hope against hope that they will experience peace and better times ahead.